Since Esteder Waxes are made out of resin, they can not be cleaned with water like sugary waxes. 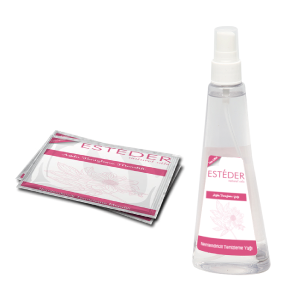 As Esteder Wax Cleaning Oil cleans up any residue also helps your skin by moisturisation with the minerals, oils and cleaning solution. With its fabulous odour you can use it as post waxing cleaning oil or even as refreshing and relieving massage oil. Clear up any residue with Esteder Wet Cleaning Wipes or Esteder Cleaning oil.You can heat up the product to be used as massage oil as well.